Uptown Update: Look Out Below! 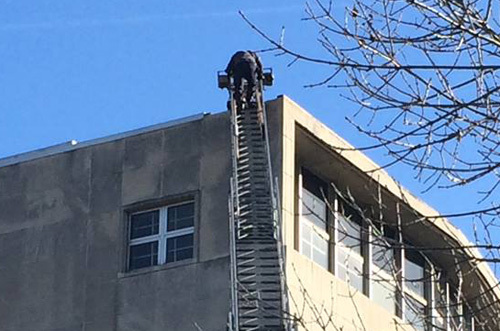 We've been posting for years that the buildings at the Maryville campus at Clarendon and Montrose are crumbling, and the roof debris is particularly dangerous to passers-by. 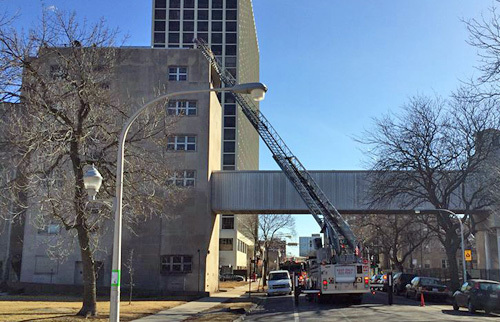 Due to the ongoing precarious situation and last week's howling winds, the Chicago Fire Department blocked off Clarendon and Montrose on Saturday and went up to the roof to remove debris to keep it from flying off and harming people on the ground. 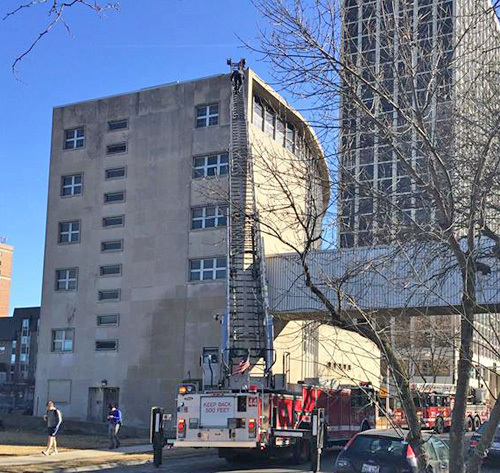 A reader reports seeing firefighters remove loose rubble and metal utility ducts from the top of the building and toss them into the fenced-off area below. We hope the situation is much safer now. Our thanks to reader William Schendel for providing the photos. Are they able to charge the owners for this maintenance service, or are the taxpayers footing this bill? Another reason why the propose redevelopment of this site should be approved and move forward. We can't have buildings like this in Uptown anymore. This building never paid taxes, so of course the tax payers are paying for it. So happy it is coming down.